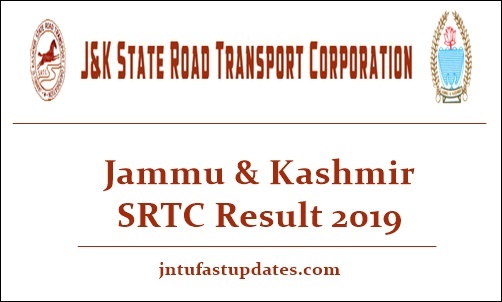 JKSRTC Result 2019: Jammu & Kashmir State Road Transport Corporation (JKSRTC) has conducted the written test for driver, conductor, and other posts on 29th January and 30th January 2019. A large number of candidates seeking to get jobs in JKSRTC have competed for the written test round this year. The organization conducted the written test in many places across the state of Jammu and Kashmir. Lakhs of hopefuls have competed for driver, conductor examination this year. The answer keys for the conducted examination have been unveiled by JKSRTC soon after completing the examination. All the competitors who have come across JKSRTC Driver, conductor written test can check the answer keys by visiting the official website, jksrtc.co.in. The competitors have to wait for a few more days to download JKSRTC Driver, conductor result 2019. Soon the JKSRTC will announce the result date on its official website. Jammu & Kashmir State Road Transport Corporation (JKSRTC) is the state government organization that controls the road transport in Jammu and Kashmir. The organization annually announces various recruitment notifications to hire the eligible aspirants into various jobs. This year JKSRTC released a notification for 342 Driver, Conductor, Security Guards, Helpers and Junior Assistants posts. Thousands of aspirants hoping to get jobs in JKSRTC have applied for the announced posts during the application dates. Candidates will be shortlisted through written test, interview round and various other screening tests depending on the designation. Candidates who performs well in all the rounds will be taken into consideration for recruitment. Hopefuls competed the written test round on 29th and 30th January can expect the JKSRTC Driver, conductor results shortly. The organization will soon announce the result date of JKSRTC driver examination. The result is expected to release in the month of March [tentatively]. Visit the JKSRTC official website, jksrtc.co.in to download the result. Stay checking the portal to check the result date. The cutoff marks/qualifying marks will be announced by the organization at the time of result declaration. Aspirants scoring the required cutoff marks in the examination are said to be cleared the written test round. The cutoff marks will be decided by JKSRTC based on various factors such as a number of posts, total number of applicants competing for the posts, and various other factors. Candidates qualifying the written test round with requisite cutoff marks will be listed as cleared the written test and the names of those candidates will be mentioned in the merit list. Search for Driver, conductor result 2019 link on the homepage. Enter the required details such as register number, password etc. The result will be downloaded on the screen.